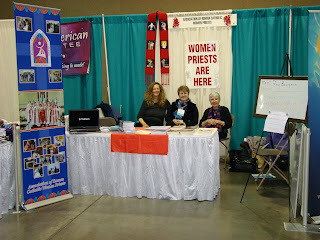 "Women Resist Call for New Theology of Women"
The smiling woman in the middle is Linda Maybin. She has shared her story of turning her life around. “I thank my children and family,including my church family for showering the love on me that helped me turn my life around”. It is love that helps us rise again. The readings for this Sunday lead us into the heart of our faith and to the secret places of our hearts where hopes and doubts and love are stored. They are about death, and life, and rising again. They are about both consolation and hope and they are about living our faith-walking the walk no matter what the challenges are. 2 Maccabees 7:1-2, 9-14 records the horrific deaths of seven passionate and courageous brothers and their mother who were willing to die rather than break their covenant with God through the Law. The book of Second Maccabees, written about 110 BC, is a series of facts and at times commentaries and legends that emphasize the hopes and sufferings of persecuted believers under the reign of the Syrians. Jews tried hard to hold on to the Law as their lifeline while enduring the onslaught of demands for acculturation to pagan beliefs. The brothers are firm in the hope of resurrection and eternal life. The resurrection is mentioned in the Bible for the first time here. (It is also mentioned in Daniel and the Wisdom books). Unlike Greek thinking that places the spiritual above the material and physical, the Jews did not separate the concepts of body and soul. Last Sunday’s reading from the book of Wisdom (11:22-26) tells us that all that God made God loved and lived in and kept alive. God lives in us body and soul, hence the belief in afterlife, eternal life, and bodily resurrection. Not all Jews believed in the resurrection. In Jesus’ time, the Pharisees did and the Sadducees did not. As our Gospel for this Sunday (Luke 20:27-38) shows Jesus firmly held, and then fulfilled, the belief in resurrection. The Sadducees tried to trap Jesus by giving him a riddle that to them meant resurrection is ridiculous-about the plight of a woman who married seven brothers according to the Law-who would be her husband in heaven? Jesus deftly showed them that heaven is not a replay of life on earth but a new play-one where there is no need for marrying as life is eternal. Both men and women are the children of God and the children of the resurrection and have eternal life. He emphasizes that even according to Moses, God is the God of the living, “All are alive to God” (verse 38). The letter of Paul to the Thessalonians is written to encourage and console this new and persecuted church made up of some Jews and many Gentiles. He urges them to live the Gospel and work to spread the good news and not sit around brooding about the end of time and hoping for the return of Christ. He assures them that God is faithful and will strengthen them. We need to know that when times are hard for whatever reasons, God does strengthen us. When times are hard there is also a hope that someday things will be better-someday and somewhere. And yet in our hearts we long for it to be better now and not “pie in the sky bye and bye”. The hopes I hear are: someday there will be peace on earth and peace right here so drive by shootings and crazy folks with big guns stop all this killing; someday I will get a good job; someday I will be poor no more; someday I will have my own home; someday I can pay my bills; someday I can afford health care for myself and my children and someday my children will have all the opportunities that I didn’t have, and especially now- “please God, don’t let them cut food stamps”. The someday needs to be now and our work is to make this happen. The life God promises needs to start now-for ALL of God’s children. For others, the torture faced is not because of religious persecution though that clearly exists in our global village, the torture is enduring an addiction or a horrific illness ourselves or with those we love dearly. We pray that this will end someday. And we pray that someday is now-that the cure is found, that the treatment helps, that the suffering will stop. Sometimes we pray for death to bring life and sometimes we pray for life to be restored and death conquered. And when death separates us from our loved ones we need desperately to know that they are still alive to God and that, still living, they are with us too. Jesus reassures us of this-“God is the God of the living…all are alive to God”. In dying we join our loving God in the Eternal Now. Yet there are so many ways that we can be dead even as our bodies are technically alive. We can live in depression so deep that we might as well be dead. We can live in so much fear-of the outside world, of other people, of danger and harm and even of our own potential that we stay fixed and do not move one inch. We can give up and not try to climb up a higher rung on the ladder when we’ve gotten messages that we belong on the bottom. We need to rise. I think of the poem Still I Rise by Maya Angelou. (Excerpted here. Our rising now is as important as rising “someday”. What is holding us back? We can become so self- absorbed that the Other barely exists or exists for our own ends. We can live in sensory deprivation cut off from the natural world and held captive by the machines and games that seem like life to us but are a complete artificial world. We can make our worlds so small that people who are not like us in looks or beliefs are exiled. We can live only for ourselves while our neighbors are in need of our love and assistance. We can think we are alive and living the Gospel when we are only pleasing ourselves. We can open or close the door on love. We can be so lonely that we build a wall that keeps people out and loneliness, which is at least familiar, in. We can talk the talk and not know how to walk the walk. We can know how perfectly well, but not exert the energy to really walk it. There are many ways to be alive and many ways to be dead. This applies to nations and cultures and churches and faith communities as well as to individuals. We need to pinch ourselves and if we have died we need to rise again. When I faced major surgery for a rare slow growing stomach cancer last February, I stared death in the face. I was frightened. I could not control my trembling. Lying down on the operating table, I said to God, I am in Your arms. And I rested because I was. I was so thankful to rise up off that sick bed and to live again. I was overwhelmed by the love of those all around me and knew deeply the love of God. Some things are the “new normal” for me, but I welcome life with a new zest and a new purpose to share the good news. And this is that news:the love of God in Christ lifts us up; the love of God is forever. God loves us like we’ve never been loved before, and that is for always. We are alive to God now and forever. Our deceased loved ones are alive with God in the eternal Now. When we die, we will live again, we will rise again. Jesus the Christ showed us how to love and how to live, how to die and how to rise. Let us shake off death and rise again-NOW! God's life. It’s here and now and for ever." death. But the story haunts us; it’s troubling. born yet. We’re past that, we think. We’re civilized now, we think. Then there are the injustices that come from our immigration policies. Over 2,500 people have died trying to cross the Arizona desert. cause of people leaving their homes. salvation—resurrection from our old lives—is to be here and now. lives, our daily activities, be an unstoppable force for goodness. 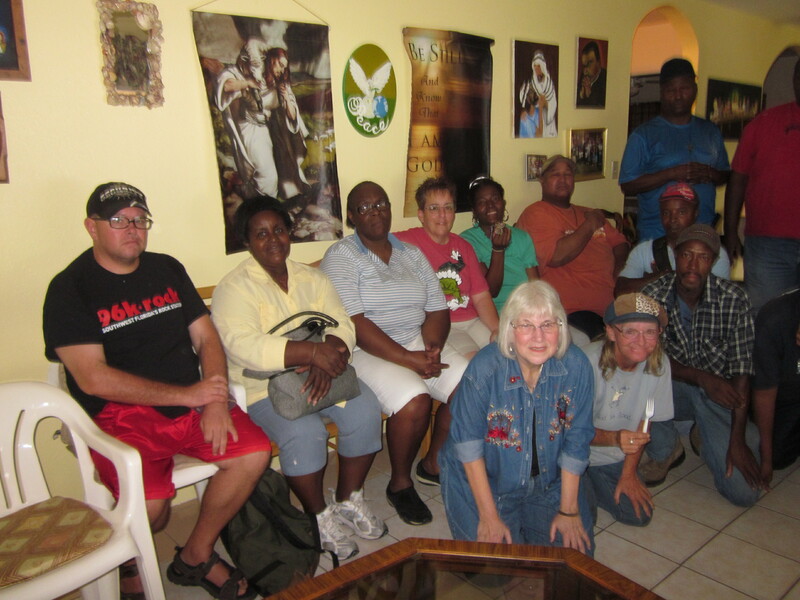 volunteer and donate to places like Claver House, Helping hands of St. If you’ve been even barely awake for the last 10 years, you’ve heard some of the endless back-and-forth about torture on our airwaves. Extraordinary rendition. CIA black sites. Sermons about the trade-offs between security and human rights. But the truth is, there are no words in any language to describe what the actual experience of being tortured is like. This video is about as close as you’ll want to get. It is said that you can’t go home again. That is true for me in literal terms. If you read my book The House on Sunny Street: a Tale of Two Brooklyns (PublishAmerica.com;Amazon.com; Band N.com)- about my childhood home, you will learn that 1185 St. Mark’s Avenue in Brooklyn ,New York is now the parking lot for the 77th Police Precinct. But you will also appreciate the history of a special house,neighborhood, and family. 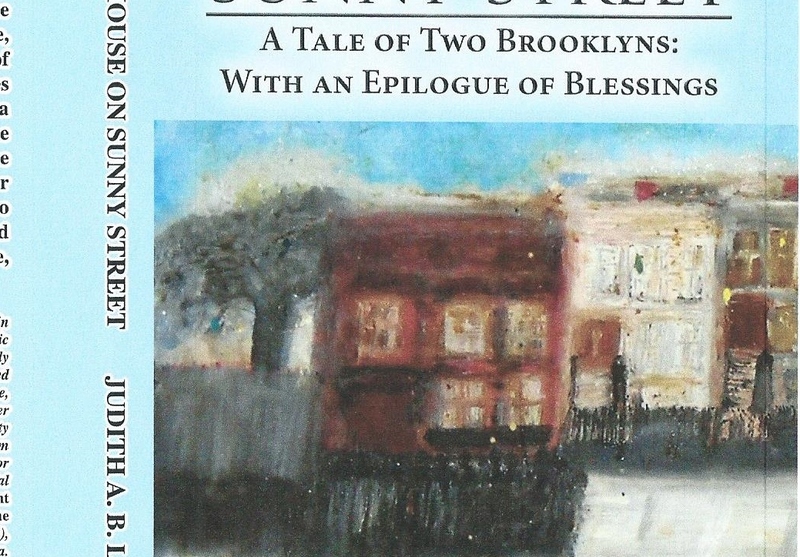 Maybe you will laugh and cry with me and my family and friends as we come of age in Brooklyn. But you will not be able to see the house beyond what exists in pictures or on the cover of the book, a painting by my mother, Anne Marie Beach. If home were only that beloved house and place and the people who lived in the house, I would not be able to go home again. It is not there and they are not there. But home is more than that. Anchored in a place, for me Brooklyn, and New York City, Long Island and Upstate New York it is also anchored in the heart and soul and spirit. It is alive there and with such life you can always go home again,and those you love so deeply are waiting there. And I do go home whenever I can. And always I am refreshed and renewed by touching Brooklyn soil and visiting friends, family and places that shaped my life and call to serve God’s people. Finally after a year and four months and some tough health issues I was able to make my pilgrimage to Brooklyn and New York on October 31st, 2013. I could only stay four days and I could not go everywhere important to me or see everyone, but I traveled a lifetime in those days. We met our close friends Danielle and Laura and went to Nathan’s in Coney Island first. As a child Coney was my favorite place to visit with my Mom and she also lived there in Senior housing facing the ocean “with a million dollar view” in the last decades of her life. My cousin Jackie grew up there. There are so many special memories there. Nathan’s was damaged when Super Storm Sandy hit New York last year. One now orders inside and eats outside. It was a chilly Halloween day and the hot chowder was a welcome lunch. We were surrounded by some homeless men and treated them to chowder and Nathan’s famous hot dogs. 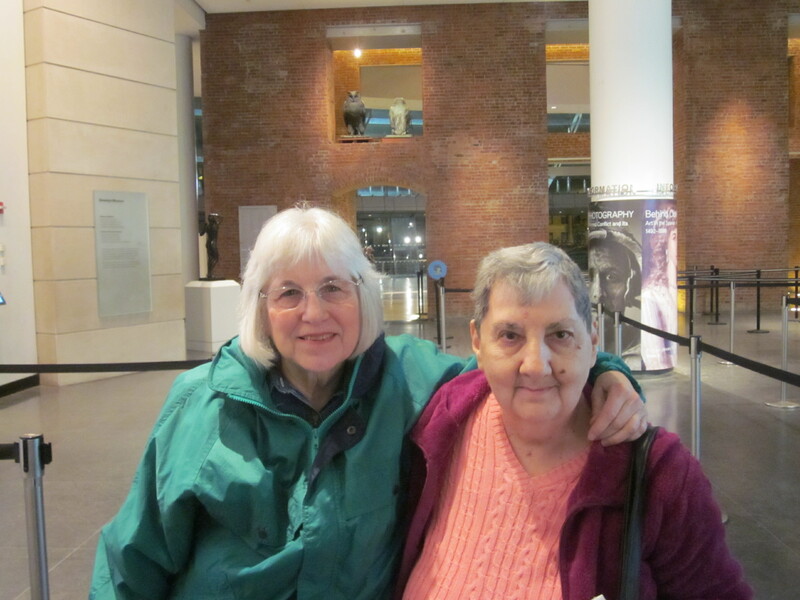 Laura said “how they find you, I don’t know-but they know!” Laura has been my friend since 1982 when I met her at a NYC Shelter for homeless women. Living still in a residential facility she moved to in 1982, she now helps countless other homeless people. 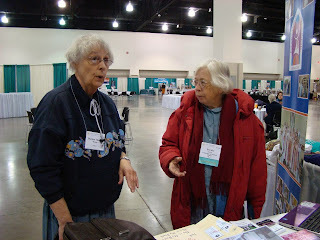 She is a faithful Jew and she explained to me that she has been praying for my health daily and with that she does a mitzvot each day so God will hear her prayers for me. I told her that she was righteous and just and a servant of our God always. Still, she said, she would do an extra mitzvot (bring someone else a blessing) for me every day. I gave her a very big hug. Laura and I are blessed with friendship. The Amusement Park was quiet and yet I could hear the happy sounds of years past. When we visited the Board walk near West 36th Street where Mother lived, the new cement “boardwalk” was undamaged but her favorite cabanas at Seagate and some of the rocky structures dividing Seagate from Coney were now under the sea and sand. Mom would not be happy about that and I still miss the real boardwalk that splintered my feet. The sea was uneasy on this chilly day but I closed my eyes and remembered how good it felt to be in it, and to be enjoying a sunny day there with my Mom. I could see her in her chair with the little beach umbrella on it. And I could see her opening her eleventh floor window and letting the good sea breeze in. She was there. We were there together again. 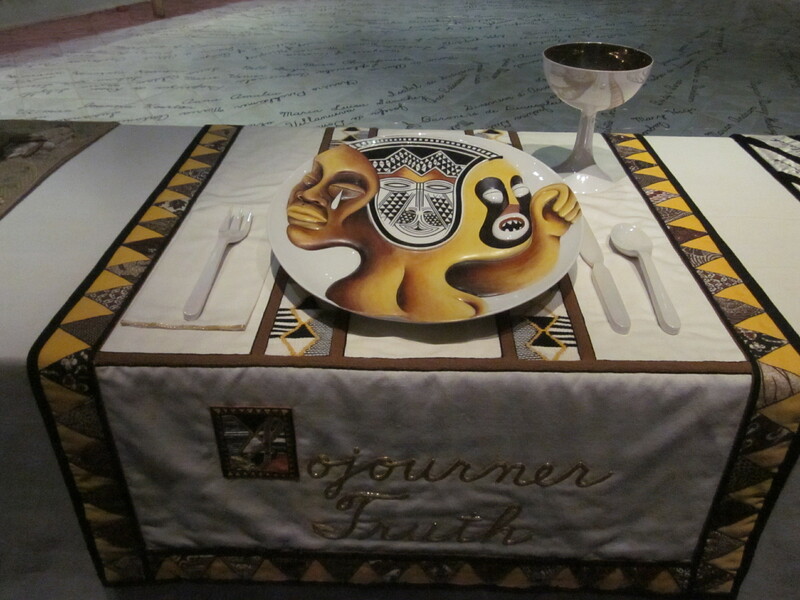 But the chill nipped and we decided to go to the Brooklyn Museum for the rest of the day. 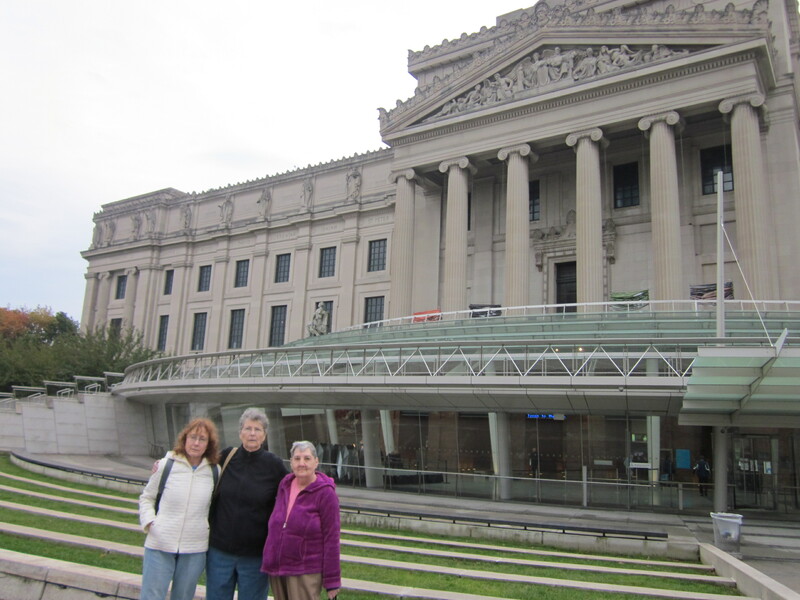 This is Judy B. and my dear friends Danielle and Laura in front of the new Brooklyn Museum. This building is a strange mixture of old and new that somehow works. I went to Prospect Heights High School just a few blocks from the Museum and it was part of my campus as were The Brooklyn Botanic Gardens, Prospect Park and the Grand Army Plaza Library. What a campus! How my friends and I loved exploring the Museum. I prefer the original building, but the additional space caused by the renovation draws one in. The floor devoted to Feminist Art was a wonderful addition. 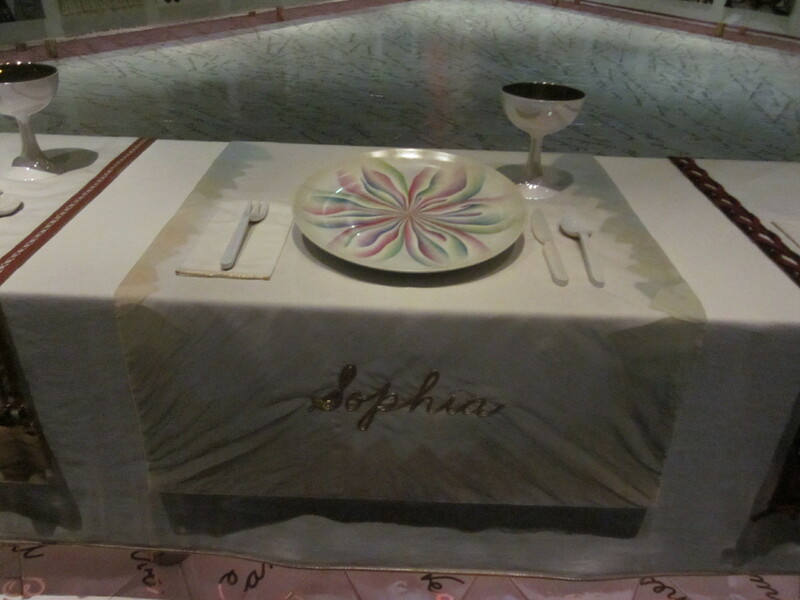 We were amazed to have Judy Chicago’s whole exhibit of the Dinner Party to ourselves. When it was there years ago, I could not even get in! Plate and place at the Table. Sophia’s plate and place at the Table. Sophia is Wisdom, the Feminine image of God. How special it was to be at the Dinner Party. The next day Judy and I went to Grand Central Station and caught the Metroline train to Beacon,New York. There we visited with Ellie Ver Nooy. Ellie is a dear friend and the widow of Pastor Dave Ver Nooy my spiritual guide mentor and friend since childhood. Pastor Ver Nooy went home to God last December. His love and guidance remained although he could no longer speak it as the Parkinson’s took its toll. Ellie gave me his well worn Book of Worship and I was so grateful to receive it. He was there on the deck facing the river where we always sat, and right next to Ellie and his beloved dog as he always was. He was there. 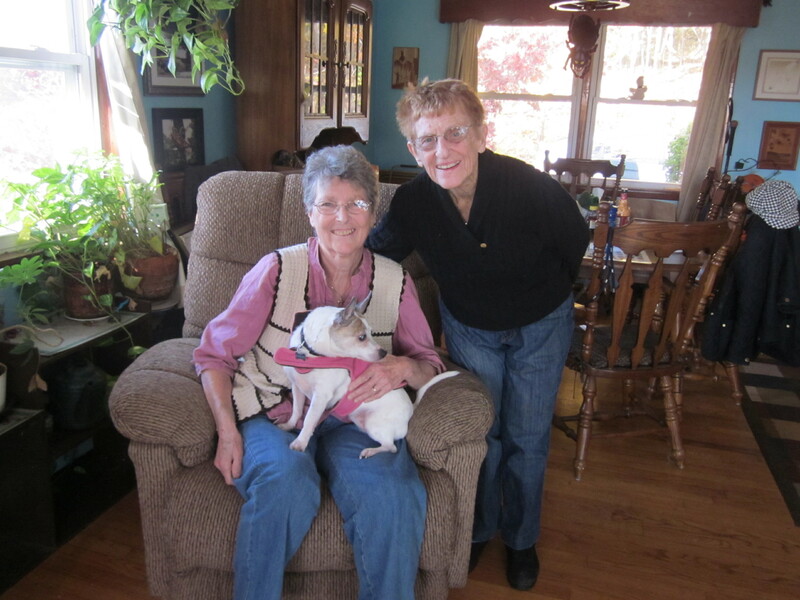 In the picture on the right,Ellie is on the right and Judy B. and Dancer are sitting in David’s chair. we went out to Long Island and visited with my family. 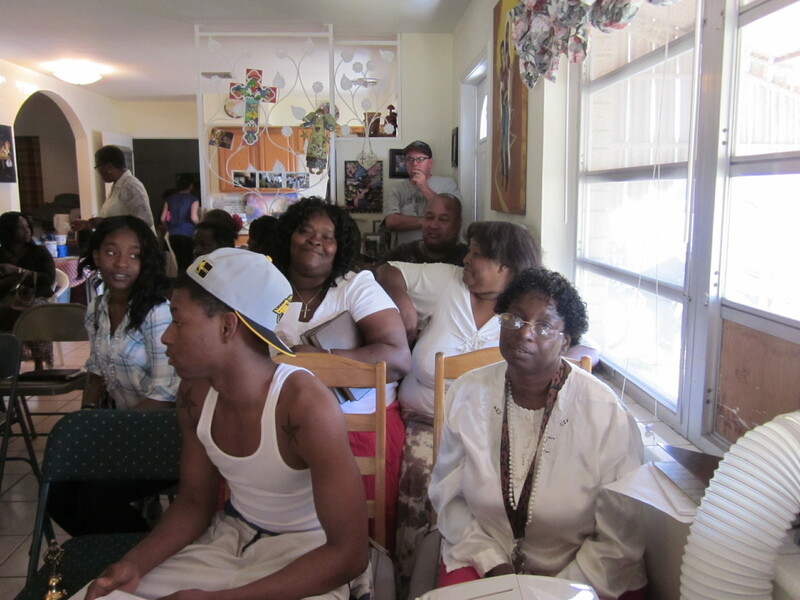 We had a cousins reunion of three branches of the Shotwell family clan and had four generations of cousins together. We are the elders now but silently our beloved elders were standing right there with us. 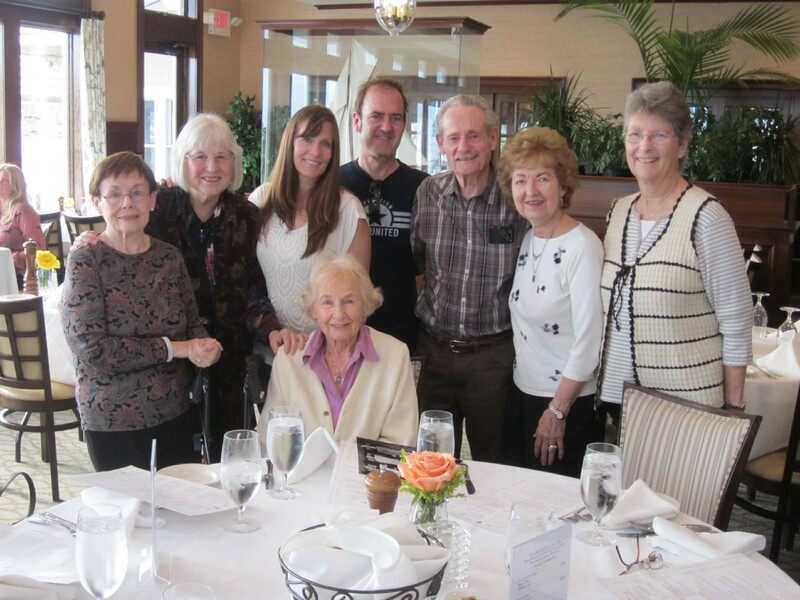 We met at Cousin Dorothy Shotwell Stewart’s house and went to a nearby waterfront restaurant for a seafood feast and wonderful reunion. Dorothy is now in her 92nd year. Bobby Robinson is now 78 and his lovely wife Barbara just had a birthday so we celebrated birthdays too. The younger members present are Lori (Robinson) Whitlatch Post and Kenneth Robinson. 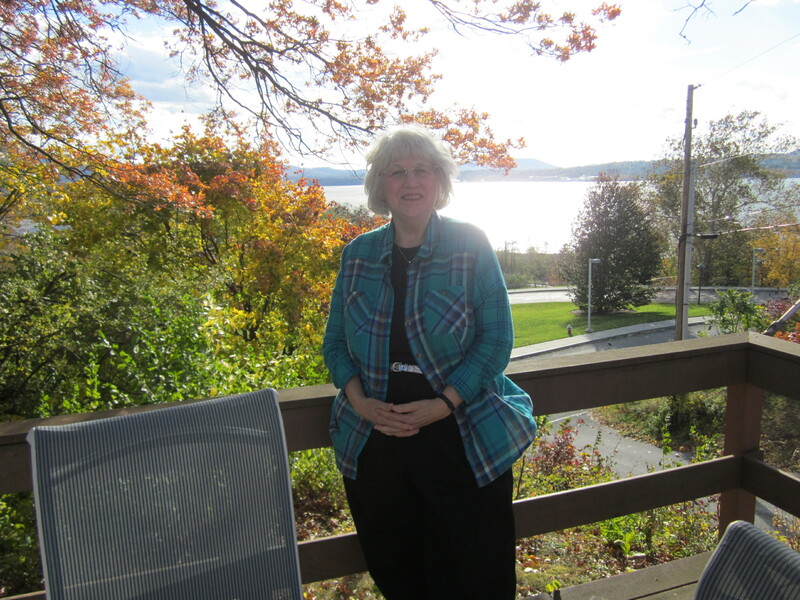 Patricia Sullivan King graciously and lovingly shepherded us for two days. Patty and her daughter- in- law Beth King who located us through her genealogy work had a wonderful brunch with us before our departure on Sunday. 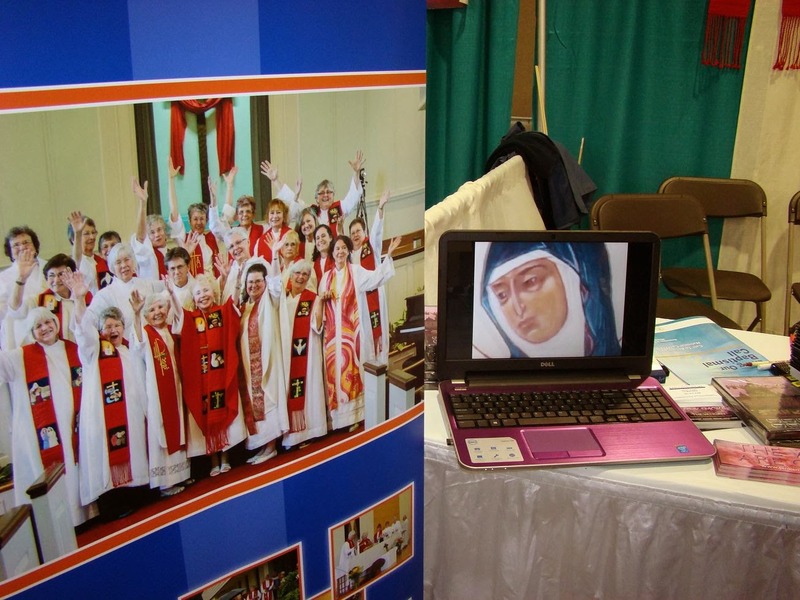 "Pink Smoke Over the Vatican," the award-winning documentary about the struggle for justice and equality for women in the Roman Catholic Church -- and how it affects women worldwide -- will be shown on Saturday Nov., 9, 3:00 – 5:00 at 2 Westmill Ln., Palm Coast, Fl. Questions and discussion will follow. The film's title came from Women's Ordination Conference (WOC) activists who burned Pink Smoke instead of the Vatican's symbolic white smoke before Joseph Ratzinger was elected pope. The WOC activists were highlighting the lack of women in the papal election process and the Vatican's ban on women priests. 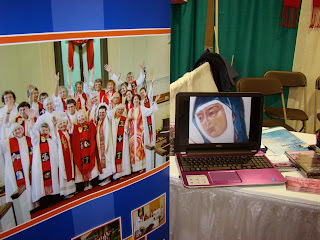 The ordination of women in the Roman Catholic Church is seen by many as a keystone to the empowerment of women worldwide. 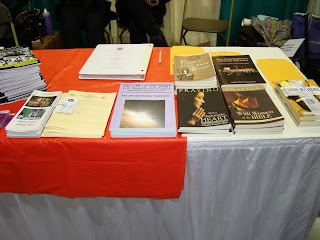 The women interviewed in Pink Smoke have made the connections between sexism in the Roman Catholic Church and discrimination and violence toward women and children in our world. These concerns include traditional prejudice, education, employment, female genital mutilation, hunger, poverty, and reproductive safety. 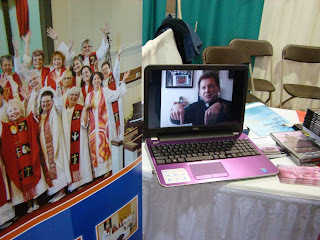 In "Pink Smoke Over the Vatican" filmmaker Jules Hart tells the story of the women priest movement in the Roman Catholic Church. “It is not every day that you meet people who give up everything for what they believe in,” says Hart, who is not Catholic, about the women priests and supporters who inspired her to make this film. 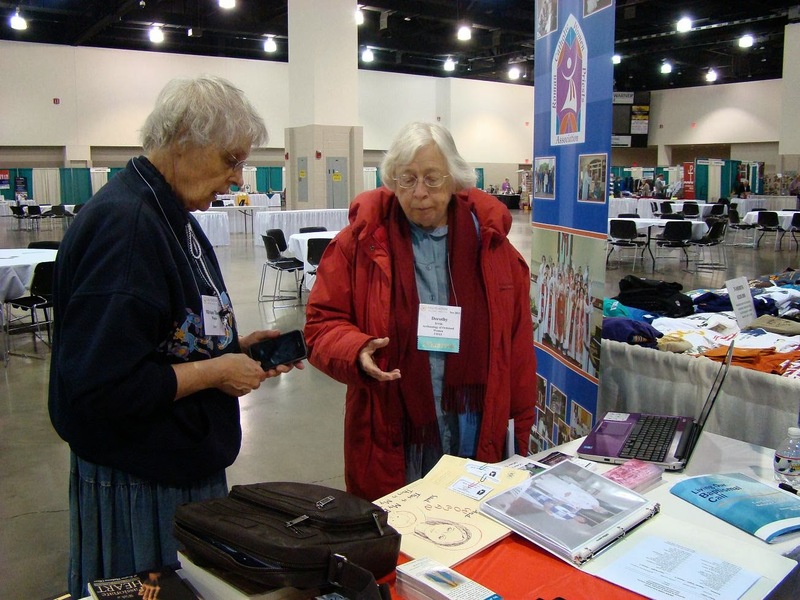 Women who are ordained -- and their supporters -- are not only excommunicated by the Vatican; if they work for the Church, they lose their jobs. Male priests who want to support the equality of women remain silent out of fear of losing their jobs and pensions. The film chronicles the history of the women's ordination movement in the Roman Catholic Church, beginning with the secret ordination of Ludmila Javorova in 1970 during Czechoslovakia's communist rule. When male bishops ordained seven women on the Danube in 2002, the Roman Catholic Women Priests movement began. 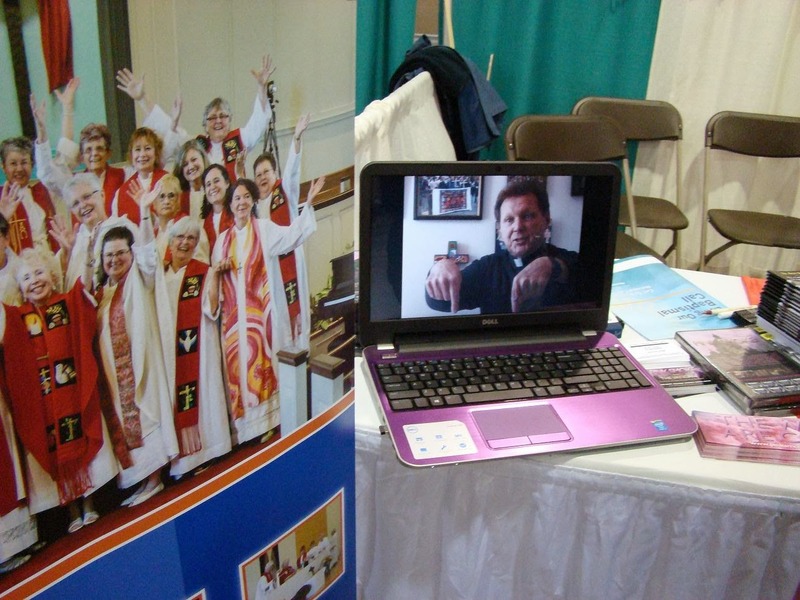 In 2003, two of the original seven women were ordained bishops. 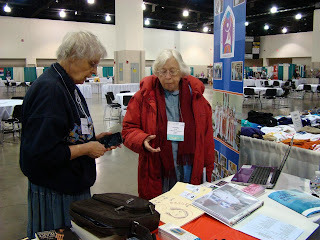 More women were ordained in North America in 2005 and in the U.S. in 2006 in Pittsburgh. 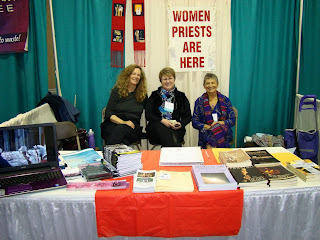 Today over 200 women have been ordained Roman Catholic Women Priests or are candidates for ordination. They are currently in 24 states in the U.S. and in nine other countries, in Latin America, Canada and Europe. 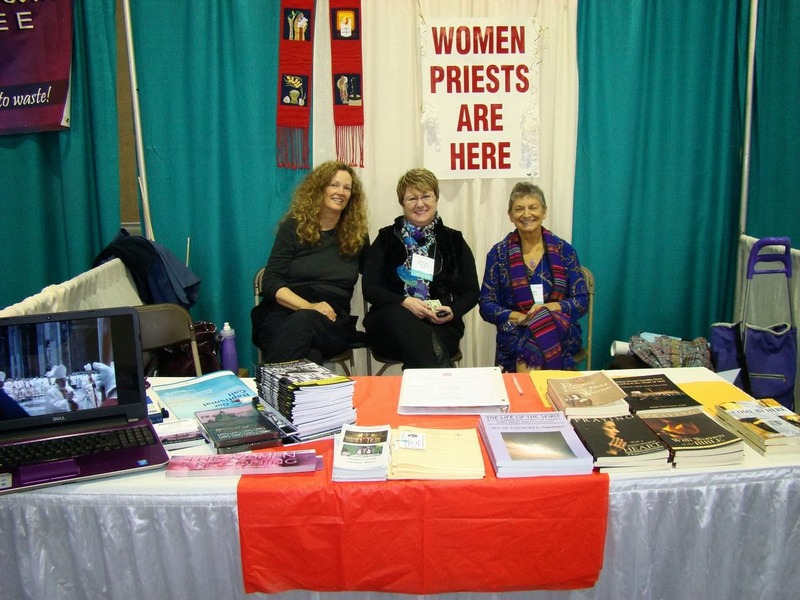 The film features interviews with some of the women who claim to have been ordained in the same line of apostolic succession that male priests and bishops also claim. It includes interviews with Catholic theologian Dorothy Irvin whose work in the early Church period has drawn attention to tombstones, frescoes, catacombs and mosaics documenting women's ministries as deacons, priests and bishops. 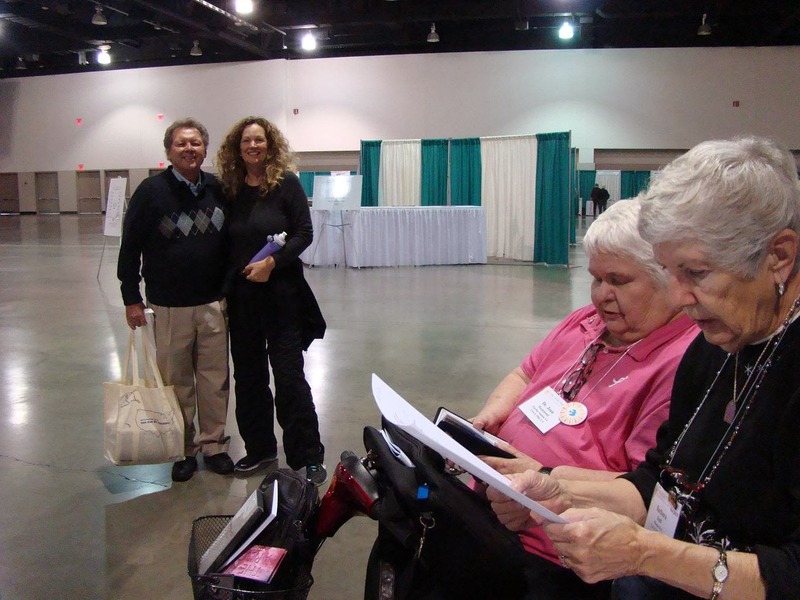 Other prominent women who have not been ordained also are interviewed. 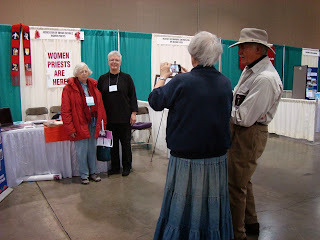 Commentary by Maryknoll priest Father Roy Bourgeois on the women priest movement and the sacrifices he made for supporting it give a male priest’s perspective on gender injustice within the Church. Also included are the perspectives of the spokesman for the Pittsburgh (PA-USA) diocese, Father Ronald Lengwin, who gives the latest official position of the hierarchy on women’s ordination. People who have seen Pink Smoke say that it is a grassroots prophetic story that speaks truth to power. talk with the Pastors and enjoy an afternoon of fellowship. lasagna dinner. 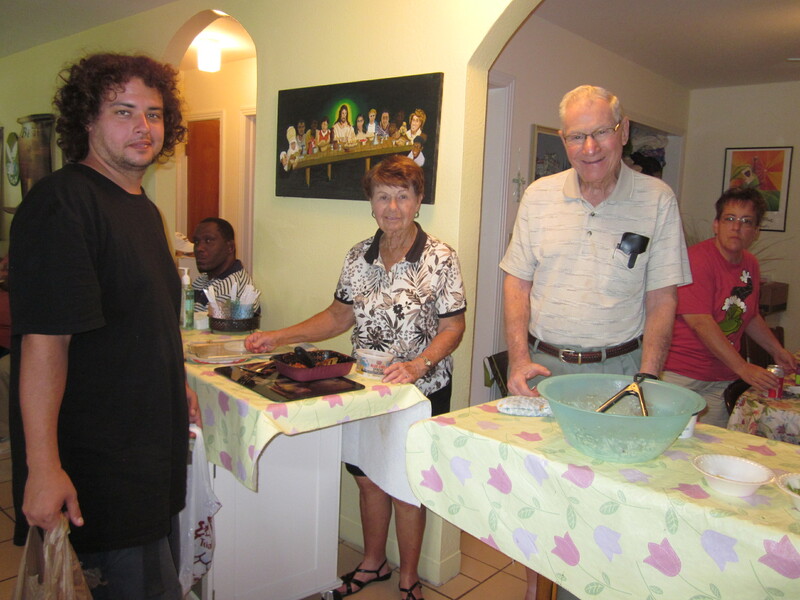 Dwayne prayed to bless the meal and also blessed them. They received loud and hearty applause. 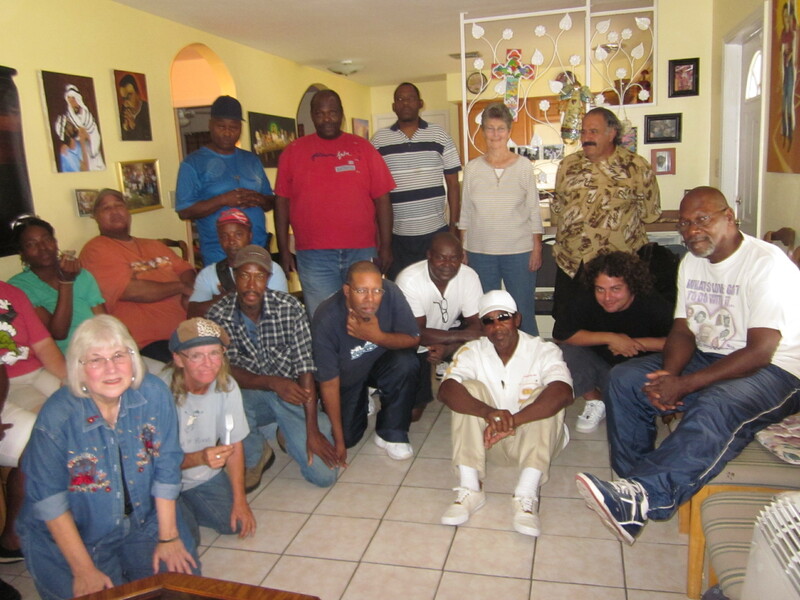 In 2009 we began Good Shepherd church in the house, a home we bought to function as a church and a transitional residence for people making the transition from homelessness. Twenty-four people lived at our Joshua House and while we had to expand our church space and no longer have this residence, all except two of those present with us today now enjoy their own homes. The community of love and faith has existed over time and distances. It is with great joy that this group gathers on Tuesday. Wisdom assured us that God loves all that God has made. “God don’t make junk” Nathaniel said. “And God loves us no matter what we are or have become. God looks at our hearts and at what we can and will become” said Lauretta. She also pointed out that Wisdom was written before Jesus was born and God’s love is as old as time itself. As we sang “This is Holy Ground” before the Gospel reading, they touched their own hearts and their neighbor’s shoulder to affirm that “we” are holy ground. congregation is how church can and should be. It is a healing balm. The issues today included unemployment, disability and ability, new housing for some and homelessness and hope for others. Reconciliation with family and part time jobs for others brought a sense of accomplishment and encouragement. One woman asked me to talk and pray with her. She recently went through a traumatic event and was feeling vulnerable and frightened. Near to a breaking point she asked Pastor Judy B and I to take her to the Emergency Psychiatric Unit at the end of the day and after my negotiation with the admitting Psychiatrist she was able to be admitted. She was so thankful and relieved to feel safe and to be where she could get help. She said that she felt safe again as soon as she got to the church and knew the answer to her troubles would be with us. She was no longer lost but found by the Jesus who seeks the lost and hangs out with the sinners and outcast. Together we all belong. Together we are church.Amen. left to right: Jules Hart, film producer of "Pink Smoke Over the Vatican"
Change for a Dollar/Recommended Video/..."sometimes, if I see a stranger coming up the road and I say, Oh, Jesus Christ, it is you again!" "An older monk tells a younger one: "I have finally learned to accept people as they are. Whatever they are in the world, a prostitute, a prime minister, it is all the same to me. But sometimes, if I see a stranger coming up the road and I say, Oh, Jesus Christ, it is you again!" This movie powerfully preached this message with few words spoken! "Lady in Red: Linda Tipped to be Cardinal" by Justine McCarthy/ Now that would be a Vatican shakeup! SHE may be a woman, married, a feminist and only 49, but an Irish theologian called Linda Hogan is being tipped as the Vatican’s first lady in red. There has never been a female cardinal, but since Pope Francis took charge in Rome eight months ago and emerged as a social liberal the unthinkable has become possible. Speculation is rampant that the reformist Argentinian Pope will invite a woman to don the red hat and sit in the Holy See’s papal conclave, which will pick his successor one day. In theory she could become pope herself. The new Pope has repeatedly said he wants to increase the role of women in the church and that it needs to develop “a truly deep theology of women”.